At the end of the day, business is all about incentives and thinking about the way people act.Understanding what motivates people is the basis for a huge field of research — behavioural economics — which can be applied to situations that extend well beyond the business world. Researchers Todd Rogers, Katherine L. Milkman, and Max H. Bazerman from Harvard Business School wanted to look at how decisions made for tomorrow differ from those made say, a few days or a week in advance. No, it’s not to burn extra calories. The idea of guilt being a weight on your shoulders is a long standing literary convention. Maryam Kouchaki andFrancesca Gino of Harvard andAta Jami of the University of Central Florida tested its basis in reality. They found that students who wore a heavy backpack experienced higher levels of guilt, and were also more likely to pick healthy snacks as opposed to guilt inducing ones like chocolate. Research from Harvard’s Amy Cuddy has found that as little as two minutes in an open, expansive stance she calls a “power pose” can increase feelings of confidence and power. It actually affects hormone levels, as this chart from the study shows. 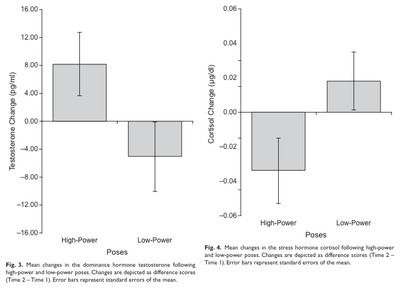 The left side shows an increase in testosterone after a high-power pose, and the right a reduction in cortisol, a stress hormone. High levels of cortisol have been shown to lead to increased abdominal fat.